NOD #6 is written – will probably be around 100 pages. Now I just need to edit and illuminate, fix some maps (it’s always something with the dang maps) and get this puppy out there. If anyone out there would like to advertise something in this issue (gratis), let me know. I can’t promise to accommodate everything (nor can I expect to get anything), but contact me and I’ll see what I can work out. My goal is to publish by the 14th, so consider the 12th a hard deadline. 2846. Sometime in the mists of antiquity, the alien tsalakians, for reasons known only to them, constructed a vast maze of corridors, tunnels and vaults plucked from the sea floor beneath the waves. As the waters of Nod receeded, this maze came closer to the surface, so close in fact that it now lurks just beneath the calm surface of the Tepid Sea. The maze is difficult to spot, and many a ship has been dashed against its walls, the inhabitants of the dungeon’s upper levels preying on the shipwrecked sailors. Denizens of the maze include aquatic ogres and trolls, sharks, a team of squid-man adventurers and a veritable zoo of alien aquatic predators. 3023. There is a tranquil pond here filled with lily pads and surrounded by tiny cottages woven from grass, leaves, twigs and reeds. A village of 200 of frog fairies is situated around the pond. The frog fairies are ruled by Queen Anabeth. Although they are not welcoming of most strangers, those of lawful alignment will be allowed to rest and refresh themselves and give tribute to the queen. Besides its warriors, the village is protected by a dozen giant frogs. | Queen Anabeth, Illusionist Lvl 8: HP 24; AC 3 ; Save 8 (6 vs. illusions); CL/XP 8/800; Special: Spells known (4th), spell points 28, silver tongue, +3 to hit with darts, magic resistance 20%, frog fairy spells. | Frog Fairy (100): HD 1; AC 3 ; Atk 2 darts (1d3) or 1 dagger (1d4); Move 9; Save 14; CL/XP 1/15; Special: +3 to hit with darts, magic resistance 20%, cast hold person, invisibility and pyrotechnics. | Giant Frog: HD 1; AC 7 ; Atk 1 bite (1d3); Move 3 (or 150’ leap); Save 17; CL/XP 1/15; Special: Leap. 3106. In the southern reaches of the forest, not far from the banks of the Danu, lies the infamous Castle of the Beast. The castle’s inhabitants were cursed years ago, its master twisted into the form of a beast (treat as a werewolf in hybrid form but without lycanthropy) and the souls of his servants trapped inside objects, unable to speak but still capable of carrying out their duties. Here, the beast broods and hunts and prays that someday the curse will be lifted. The castle has a sinister cast to it. It is surrounded by well-tended gardens and vineyards, but the fields surrounding the castle are fallow and wild pigs and cattle can be found in the surrounding woods. There is a dilapidated landing and boat house on the Danu about 1 mile away from the castle. The landing is connected to the castle with an overgrown stone path. Warnings have been carved on the boathouse walls by the claws of the Beast himself. Those who would storm the castle for its treasures will be sorely disappointed, for though the castle holds many valuable items (see below), those who possess them for more than a day have their souls trapped within them (per Magic Jar spell) until the curse is removed by a cleric of at least 10th level. Treasure: The Beast’s treasure is in multiple trapped chests. It consists of 11,000 gold pieces. There is a winter wolf rug worth 1,000 gp stretched in front of the hearth of his great hall. The Beast wears an ivory broach carved in the image of his mother (worth 500 gp) and a weapon belt held with a silver belt buckle (worth 250 gp). Above his torn and tattered bed hangs a now-inverted holy symbol made of silver and platinum worth 750 gp. | The Beast: HD 4 (26 hp); AC 3 ; Atk 1 bite (2d4); Move 15; Save 13; CL/XP 4/120. | Animated Object (Small): HD 1; AC 5 ; Atk 1 slam (1d3); Move 15; Save 17; CL/XP 1/15. | Animated Object (Medium): HD 2; AC 5 ; Atk 1 slam (1d6); Move 12; Save 16; CL/XP 2/30. | Animated Object (Large): HD 4; AC 5 ; Atk 1 slam (1d8); Move 9; Save 13; CL/XP 4/120. 3211. A deep, natural trench in this hex holds thousands of writhing man-sized giant centipedes, attracted, apparently, to a magic helm at the bottom of the trench. The helm is made of gold, and thus heavy and offering little protection. It is shaped like a skull-cap with a nasal guard and a crest composed of a number of rounded nubs. Wearing the helm makes it possible for you to communicate with vermin and for them to communicate with you. In addition, you gain the ability to “turn” vermin and oozes as a 3rd level cleric, but at the cost of 1d6 points of temporary wisdom damage. 3310. A seemingly abandoned village in this hex contains a remarkable sight – dozens of villagers and twenty ogres frozen into statues of quartz by some unknown agency. Some searching will reveal one robed individual, on hands and knees in a doorway looking out at the slaughter, hand raised as though in the process of casting a spell. In fact, the wizard is responsible for the spell and the attack. The ogres had been tracking him for several days, he being injured in a previous encounter and seeking healing. The villagers took him in, and he rested for a few days before the ogres arrived. The quartz effect is merely an optical illusion of people frozen in time until some other equally powerful wizard (Morthern is a level 9 wizard) can undo the incantation (known colloquially as Morthern’s Moment in Time). 2235. The hither gnome village of Borbet overlooks the sea. Its inhabitants make their living by fishing, keeping guinea fowl, and growing vegetables in well-tended gardens. The village’s population stands at 150 gnome-wives, 80 gnomelings and 230 gnomes. They dwell in several dozen stone cottages built around a central square that contains a stone well. A low stone wall surrounds the village. It has two gates on the east and west sides of the village, each overlooked by a tall wooden tower. The walls and towers are covered by creeping, flowered vines. Borbet is known for its fine, pale ale and its smith-work. The smiths of Borbet maintain a forge in a sea cave, allowing them to harness the elemental power of wind and wave when manufacturing their magical weapons and shields. The village milita consists of 115 gnome warriors under the command of Nereva. The village is governed by a warlock called Kindle. Treasure: The town treasury holds 4,085 sp, 2,860 gp, a hematite worth 65 gp, a bronze statue of Mercurius worth 3 gp and 3 sq. yd. of linen worth 12 gp. It is locked in an iron chest with a complicated lock in the cellar of the mayor and guarded by a bull mastiff. | Kindle, Gnome Magic-User Lvl 9: HP 20; AC 9 ; Save 7 (5 vs. spells); CL/XP 11/1700; Special: Spells (5th), phantsmal force 1/day. Golden amulet of office worth 1,000 gp, beechwood staff carved with gnome faces, silver dagger, money pouch stuffed in right boot containing 30 gp. 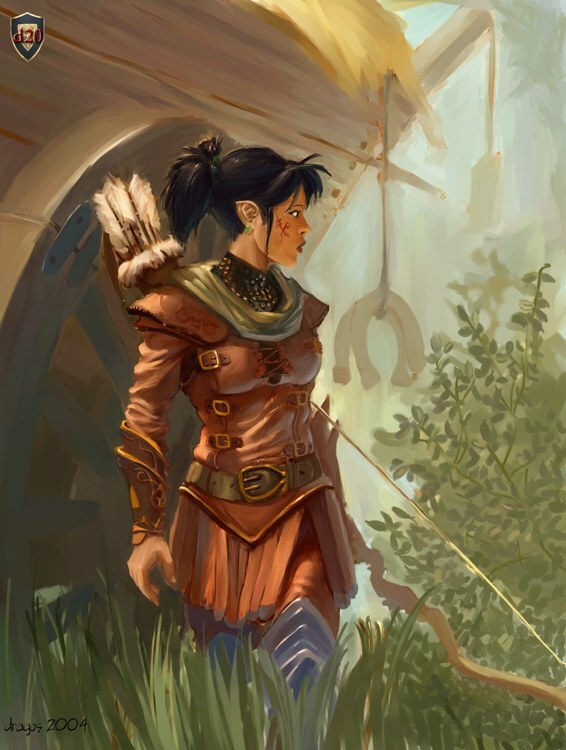 | Nereva, Gnome Fighter Lvl 5: HP 19; AC 4 ; Save 10; CL/XP 5/240; Special: Phantasmal force 1/day. Chainmail, shield, boots of elvenkind, short sword, short bow, dagger. 2337. On a granite promontory that juts into the sea there is an ancient, weathered stone chair. Legends say that those who spend the night of a full moon sitting in the chair will learn the secret of their doom and how to avoid it. In truth, they will probably be killed by the enormous black pudding that lives inside the promontory and seeps out the cracks to engulf the chair each night. | Black Pudding: HD 10 (60 hp); AC 6 ; Atk 1 attack (3d8); Move 6; Save 5; CL/XP 11/1700; Special: Acidic surface, immune to cold, divides when hit by lightning. 2410. The Blood Hawks are the most northerly of the orc clans and the weakest, having recently been decimated by the adventuring company from Blackpoort. The Blood Hawks have 100 warriors. They are ruled by Nar, who is assisted by Zhor, a shaman of the Gods of the Lake (see Blackmere Lake). The Blood Hawks dwell in a cavern lair set amidst rugged cliffs. They fletch their arrows with blood hawk feathers and paint the birds on their shields. | Nar: HD 5 (21 hp); AC 4 ; Atk 1 battle axe (1d8); Move 9; Save 12; CL/XP 5/240; Special: None. Chainmail, shield, battle axe. | Zhor, Orc Adept Lvl 3: HP 10; AC 7 ; Save 13; CL/XP 4/120; Special: Spells (1st), alchemist (brews poisons). | Blood Hawk Orc: HD 1; AC 6 ; Atk 1 spear (1d6) or short bow (1d6 + poison); Move 9; Save 17; CL/XP 2/30; Special: Poison on arrows causes paralysis for 1d3 rounds. 2516. In a dry gulch called the Valley of the Angel there is a small village of folk who make their living collecting the valuable resins from the acacia trees that grow therein. The valley is named for a rock formation that looks vaguely like a winged creature bent down on one knee. The village is built around the base of this natural monument and consists of small hovels woven from the branches of the acacia. It is protected by a dry moat and a low wall of stacked stones. The village is ruled by Baron Nestor the Mad, an outcase of Antigoon who seized control of the village with his hired goons as a young man and has ruled it ever since. He is now pushing 60, not long for the world and fretting over the fate of his only child, Krapahild, now 30 and unwed. Krapahild, of course, is not in the least worried. She longs for freedom from her impetuous, often schizophrenic father, and enjoys a fine reputation among the villagers, who often seek her wise council and will almost certainly accept her as their new baroness on the passing of her father. The 20 warriors of the village wear ring armor and dashing white capes and wield shield and longsword. 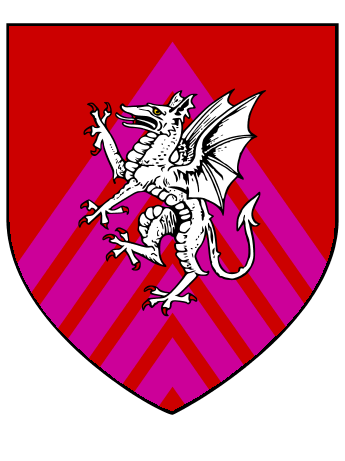 They are commanded by Morward, a man of 50 years who has served the baron since before his exile. 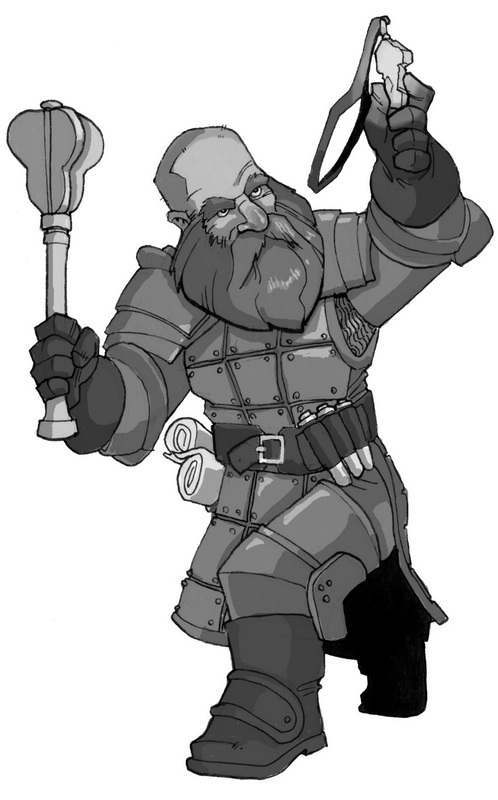 Morward is an unassuming man, grey-haired and slight of build, who happens to be a very skilled assassin. Morward is quite a bit less excited about Krapahild assuming command of the village, and would gladly marry her or kill her to remain in power. Treasure: 1,800 sp, 102 gp and a hematite arrow worth 105 gp. | Morward, Assassin Lvl 6: HP 25; AC 7 ; Save 10 (9 vs. death); CL/XP 6/400; Special: Decipher script, disguise, sneak attack x3, skullduggery, poison. Leather armor, buckler, long sword, several daggers and poisoned darts hidden on his person. 2710. A small band of bugbears is traveling to join the hobgoblin army in  before they cease being. The bugbears travel only at night, and are a strange band indeed. 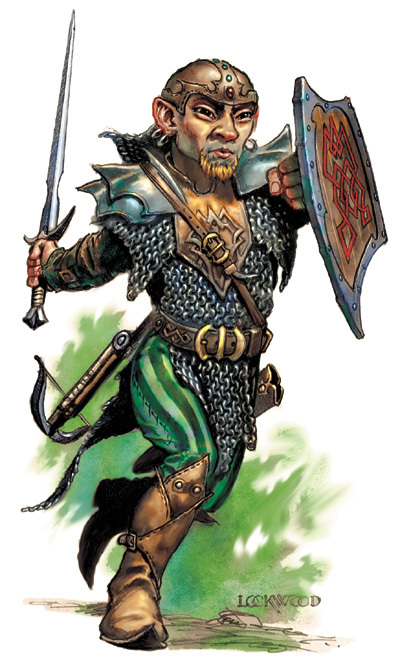 The leader of the band is Zorion, a yawahu bugbear, albino sorcerers akin to ogre magi. His comrades are the product of his dealings with demons, mutants possessed of extraordinary powers. | Zorion, Elder Yawahu: HD 6 (36 hp); AC 5 ; Atk 1 spear (1d6+1) or 1 shortbow (1d6); Move 12; Save 11; CL/XP 7/600; Special: Spells – charm person, magic missile, cause blindness, invisibility, weakness (rev. of strength) and rope trick. Wears a cloak of elvenkind he stole from a hapless adventurer on the way. | Zunx, Undead Charred Skeletal Bugbear: HD 3+3 (22 hp); AC 5 ; Atk 1 bite (1d8+1); Move 9; Save 14; CL/XP 7/600; Special: Surprise on 1-3 on 1d6, surrounded by cloud of ash (10’ radius, save or cough and choke, suffer 1d3 damage, -5 to hit from obscurement), touch causes metal to heat (per heat metal spell), rebuke undead as lvl 3 cleric, only harmed by magic weapons, at 0 hp explodes into 3 dice fireball. | Nobbit, Tenebrous Bugbear: HD 3+1 (20 hp); AC 2 ; Atk 1 bite (1d10+1 + 1d6 acid); Move 9; Save 14; CL/XP 4/120; Special: Surprise on 1-3 on 1d6, acidic bite, filiments on head inject poison into unarmed attackers (paralysis 1d4 rounds). | Unog, Demonic Bugbear: HD 3+1; AC 4 ; Atk 2 claw (1d6), bite (1d8+1); Move 9 (F9); Save 14; CL/XP 7/600; Special: Surprise on 1-3 on 1d6, immune to poison, half damage from acid, cold, electricity and fire, only harmed by magic weapons, magic resistance 15%, cast darkness 15’ radius and inflict light wounds 1/day. Unog is a distant relation to Melchom, Paymaster of Hell. | Tmor, Blink Bugbear: HD 3+3 (16 hp); AC 5 ; Atk 1 bite (1d8+1); Move 9; Save 14; CL/XP 4/120; Special: Surprise on 1-3 on 1d6, cast dimension door, blink as blink dog. | Gux, Undead Bloody Bugbear: HD 3+3 (21 hp); AC 2 ; Atk 1 bite (1d8+1); Move 9; Save 14; CL/XP 6/400; Special: Surprise on 1-3 on 1d6, damage from bite adds to its own hit point (up to 27), creatures killed by it become zombie spawn, magic resistance 15%, only harmed by magic weapons. | Zbugod, Giant Bugbear: HD 4+1; AC 3 ; Atk 1 bite (1d10+1); Move 12; Save 13; CL/XP 4/120; Special: Surprise on 1-3 on 1d6, throw boulders (40’ range, 1d10 damage). 2735. The sea dragon Zavicus makes its lair here in the submerged dome of some ancient sea fortress. Zavicus is a small dragon, about the size of a horse, with smooth, black skin and markings reminiscent of an orca. He is highly intelligent, but unable to speak or cast magical spells. Zavicus keeps its treasure in a large, round pit in the center of its lair. Seven mer-maids of exquisite beauty are kept there as the dragon’s prisoners, all chained to metal hoops that circle the treasure pit. | Zavicus: HD 9 (36 hp); AC 4 ; Atk 2 claws (1d6), bite (1d8); Move 12 (S24); Save 6; CL/XP 12/2000; Special: Only harmed by magic weapons, can emit a cone of sound (30’ long, 20’ at base, 9d8 damage and deafness, save for half damage and to negate deafness), claws are so sharp one must save against them or begin bleeding (1d4 damage per round until cured by magic or staunched by normal means). 3427. Loquash, the mythic “Invisible City” is situated near the banks of the Vrusk River. The city and its inhabitants are only visible in the moonlight, becoming completely visible during the full moon and otherwise existing in an invisible, quasi-real state the rest of the time. The Loquashi have ophidian blood flowing through their veins, and their time under the curse has diminished them, making them about 5-ft tall on average. Their skin glistens like thousands of pink and yellow diamonds, their features would be elven save for the fact that their arms are more swept back and their torsos are a bit longer. They are terribly graceful, and sneak through the world, collecting secrets and knowledge and stealing precious articles, leaving clues to the location of the Invisible City to lure those from whom they have stolen to them during the full moon. These intrepid investigators are greeted warmly, their property returned to them, and they are permitted to feast on delicacies, the food being poisoned to turn the guests into Loquashi themselves. Loquash has walls of pearly stone that gleam and shimmer in the moonlight, and thirty tall towers of dark, polished wood that rise 30-ft above the 30-ft stone walls. The city’s gates are polished steel and decorated with whimsical arabesques. The buildings within the city walls are graceful, most in the style of slim towers that taper gently from base to peak. They are topped with observation decks to permit the inhabitants to gaze at the stars. The streets of the city that are paved are paved with grey cobblestones. The city’s primary industries are the exchange of secrets and knowledge (their invisible lurkings around the world have brought them much knowledge) and the catching of fish in the Vrusk River using nets that, for most of the year, are completely invisible. The lands around Loquash appear to be barren under the light of day, but the moon reveals them to be lush croplands of beets, dates and pears and durum. Goats are kept for their milk, but they are never killed. Loquash, in the days of the Lizard Kings when it was a normal city-state, was known for its fine metalwork, and in fact is still produces exceptional work. The city is also known for its lush parklands and its race track, where the locals watch the newt derbies. Loquash once had a ruling monarch, but it was the king’s sinful ways that brought the curse of the gods down on the people’s heads. Since then, the palace has been allowed to sit empty, a monument to vice, and the priesthood has ruled the city with a gentle hand. The Loquashi, most of whom are not born, but rather made, have few family ties. Instead, people are stratified by classes based on their skills. The wise make up the ruling class of priests, while the dextrous and intelligent make up the middle class of artisans, sages, mages and thieves. The strong and tough make up the lower class of warriors, servants and laborers, while the charismatic make up the slave class of jugglers, actors, poets and storytellers. The Loquashi worship the old gods of the ophidians, from whom they received their curse and to whom they beg for forgiveness. The two main deities of Loquash are Saclist, the goddess of virtue (which the ophidians define as loyalty and dilligence) and Phu’abbo, the lustful god of dreams. Minor divinities include Latha, god of craftsmen, Azol, goddess of wealth and Phothar, goddess of winter and dreaded hibernation. The days of the full moon are grand celebrations in Loquash in which the people travel a cirrcuit around the city to each temple, reciting prayers and leaving offerings of flowers and prayer scrolls scribed in their own blood. During the full moon, the taboo on physical contact is lifted and much revelry ensues. It is also during this festival that most outsiders come to Loquash and are tricked into consuming the city’s accursed food. The priests of the city-state wear bronze masks and go everywhere carrying censers burning sweet resins. The soldiers of Loquash are apathetic and poorly trained. They wield morninstars and light crossbows, and primarily fight in the hopes of taking slaves. The army numbers 350 men-at-arms (HD 1d6), 20 sergeants (HD 3d6) and 2 captains (HD 5d6). The Hanged Man is the finest tavern in Loquash. Located in the center of the city, it features service and fare fit for a lord (and priced for a lord as well). The tavern has two medium-sized rooms for rent, though they are occupied about 50% of the time. The Hanged Man is always loud and bustling, with dozens of tables featuring card games. They serve fermented goat milk and curds of goat cheese as well as many fine raw fish dishes. Some of the more interesting people of Loquash include Shollo, a member of the old royal family who has suffered many financial setbacks since the overthrow (and who insists he has amble gold in his old apartment in the royal palace, if only someone would retrieve it); a seductive mage named Zhaua who is toiling under the threat of blackmail; Thath, a wealthy garrison commander whose schemes go far beyond Loquash and Thigomin, a wealthy courtesan who has dabbled with many powerful priests and who spends money very freely. Loquashi Characters: The fact that the Loquashi spend most of their time invisible makes them problematic as player characters, but excellent foils with which to challenge the player characters. Treat the Loquashi as elves with a +2 bonus to save against poison instead of an immunity to Charm Person and Sleep. In addition, their “class versatility” ability replaces Fighting-Man with Thief (the one published in NOD #2 or any other version you favor). 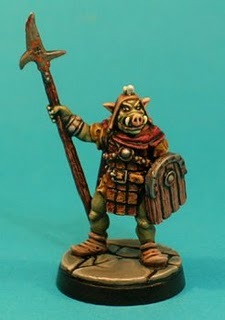 Miniature from Otherworld Miniatures, painted by Richard Scott. About 3 weeks out from publishing NOD #6 (I hope). I have about 80 more encounters to write and a few other things to polish off, including level 3 of Izrigul’s Pleasure Palace. Busy busy. 2109. A horde of 50 lepers are on the march through this hex, pilgrims from Lyonesse making their way to the medicinal springs in  that are now menaced by giant rock weasels. The pilgrims are led by the paladin Sir Juste, and his companions, Friar Owelle, Sir Tadith and ten fighting-men. All are mounted on warhorses and armed with platemail and shield. They are currently making camp, the named characters and men-ar-arms in pavilions, the lepers under the stars. 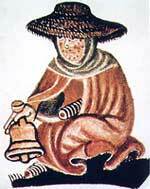 Friar Owelle owns a magic rope, the silk entwined with silver thread. When laid on the ground in a roughly circular shape, it acts as a Protection from Evil spell for those located inside the circle. | Sir Juste, Knight of the Jaguar, Paladin Lvl 6: HP 41; AC 2 ; Save 11; CL/XP 7/600; Special: Detect evil, protection from evil, immune to disease, cure disease 2/week, lay on hands (12 hp), turn undead as 4th level cleric, immune to fear, allies are +2 to save vs. fear. Platemail, shield, lance, long sword, holy symbol, jaguar skin worth 25 gp worn as a cape, 20 pp. | Friar Owelle, Cleric Lvl 4: HP 16; AC 2 ; Save 12 (10 vs. paralysis & poison); CL/XP 5/240; Special: Spells (2nd), turn undead. Platemail, shield, mace, holy symbol, magic rope (see above), 17 pp. | Sir Tadith, Fighting-Man Lvl 4: HP 24; AC 2 ; Save 11; CL/XP 4/120. Platemail, shield, horseman’s axe, lance, dagger, 16 pp. 2115. The most poweful clan of orcs in the Gaestly Hills are the Bloody Fangs. The Fangs are the most barbaric and superstitious of the orc clans, as their territory borders the land of the Barrow Fiends. 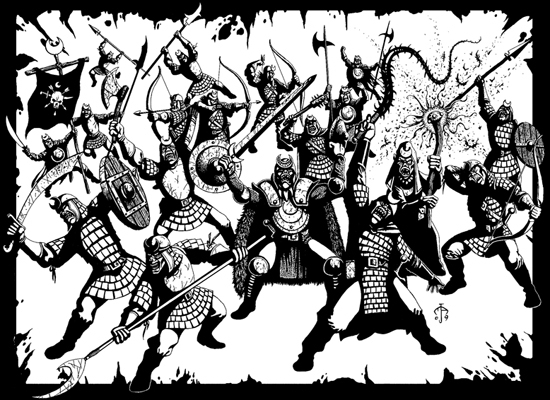 The Bloody Fangs consist of 250 black orc warriors. Black orcs have blue-black skin and red-rimmed eyes. They are devotees of the demon prince Orcus, and many show signs of demonic heritage. Black orcs wear armor of iron scales, iron shields painted with bloody fangs, light crossbows and battle axes. The Bloody Fangs dwell in a cavern lair. The entrance is about ten feet above a boulder-strewn field. The Bloody Fangs are led by Thangblad. Thangblad maintains a bodyguard of six zombies. He is assisted by 20 sergeants. Treasure: Kept in a locked chest. Consists of 150 gp, 800 sp and 1,700 cp. | Thangblad, Orc Adept Lvl 6: HP 28; AC 5 ; Save 10 (6 vs. undead); CL/XP 7/600; Special: Rebuke undead as 3rd level cleric, spells (2nd), berserker. Leather, shield, rusty spear caked with dried blood. | Black Orc: HD 2+2; AC 3 ; Atk 1 weapon (1d8+1); Move 9; Save 16 (12 vs. undead); CL/XP 2/30. | Black Orc Sergeant: HD 4+4; AC 3 ; Atk 1 weapon (1d8+1); Move 9; Save 13 (9 vs. undead); CL/XP 4/120. | Zombie: HD 2; AC 7 ; Atk 1 weapon (1d8); Move 6; Save 16; CL/XP 2/30; Special: Immune to sleep and charm. 2128. This area of the Grete Myre, nicknamed the Pismyre, receives most of the run-off from Antigoon’s open sewers. It is inhabited by several gangs of gulguths and at least thirty otyughs. Encounters with one or both occur whenever one travels through the area (1-3 = 1d8 gulguths, 4-5 = 1 otyugh, 6 = both), so the locals avoid it at all costs. 2138. Sailor’s Rest is an interdimensional rest home for sailors. One will spot Vikings, New England whalers, Chinese merchants and Napoleonic sailors in this place, all living in a large manse that appears to have been built from ship wrecks. The men are stereotypical old salts. They live off of fishing and crates of foodstuffs and spirits salvaged by mermaids from lost ships. Visitors are welcome, and can expect a supper of hard tack, salt pork, fish stew, turtle soup, grog and plenty of tall tales. The sailors never leave their home (except by death, when they are given a Viking funeral), so they know little of the surrounding area. Since most do not come from Nod, only a few are knowledgeable about the Tepid Sea or Mother Ocean. All of them know of the Meistersinger , for he visits every few months to swap stories and sing shanties. The old men have no real treasure, for they’ve little need of it. One might find a silver pocket watch or some scrimshaw. They arm themselves with broad swords and hafted hooks. | Old Salt (25): HD 4; AC 7 ; Atk 1 weapon (1d8); Move 12; Save 13; CL/XP 4/120; Special: None. 2207. Wulum the Bald, a hefty barbarian prince has built a small motte-and-bailey fort in this hex in a wide valley of soft, green meadows watered by a sparkling stream. The southern half of the valley is hemmed in by chalk cliffs (worked by a few stout halfling miners in Wulum’s employ), while the northern walls of the valley are old, weathered basalt and studded with small caves. The castle is constructed of creamy, white stone and pine and inhabited by a small court of servants and laborers, 12 tawny-headed berserkers and 15 men-at-arms equipped with ring armor, shields, spears and short bows. Wulum is tall and quite fat, and despite his wild, ice-blue eyes and unkempt black beard, very logical and intelligent, traits not normally associated with barbarians. He hails from the Chimeria (located north and west of this region). He is happily wed to his court magician, Orandjia the Grey, a high-born exile from Blackpoort with grey eyes, long, black hair worn in braids and a delicate face that belies the woman’s powerful ambition and hatred for her city of birth. The castle is surrounded by several hovels inhabited by a mix of human, halfling and dwarf yeomen – mostly herders of sheep and cultivators of flax and rye. They are currently constructing a dye house. Wulum is a tremendous host, sharing all he has with visitors provided they show he, his wife and his people respect and provide good company. Treasure: 2,790 gp, 5 lb of cocoa (100 gp/lb), 2 lb of tobacco (100 gp/lb), 12 barrels of ale (30 gal., 250 lb, 6 gp each). | Wulum the Bald, Barbarian Lvl 12: HP 84; AC 6 ; Save 4; CL/XP 12/2000; Special: Immune to backstab and flank bonuses, berserker (+2 to hit and damage, -2 to AC for 12 rounds, fights beyond 0 hit points while berserk). | Orandjia, Magic-User Lvl 8: HP 18; AC 9 ; Save 8 (6 vs. spells); CL/XP 10/1400; Special: Spells (4th). Robes of dark blue velvet over comfortable clothing, a slim crystal wand and silver dagger. Ah – the unlucky post. Five more encounters for Western Venatia. If all goes well, I’ll publish PARS FORTUNA this weekend. I’m still waiting for one last piece of art – if it comes through I’ll publish the complete rules on Lulu.com – should go for $15 in book form, $7 in e-book format – and the basic rules in the free download section on this blog. If the picture doesn’t come through, I’ll still probably publish the free version. Cross your fingers. 1636. All that remains of an ancient elf hunting lodge is a support column carved to look like three thin beeches braided together. A stone foundation traces a large footprint – the lodge must have been quite a sight in its day. There is little rubble left from the thing, and the forest is slowly but surely reclaiming the site. Should one rap three times on the surviving column, a trapdoor will open nearby to reveal a set of stone stairs descending into a cellar. The cellar is divided into two sections. The first is a fairly common root cellar loaded with urns, amphorae and barrels of spoiled or dried foodstuffs and sour wine. In one wall of the root cellar there is a sturdy, steel door that is quite cold to the touch – cold enough that prolonged contact begins causing frostbite (1d4 damage). Behind the frozen door there is a small chamber with steel walls that was magicked long ago into a sort of freezer. Freezer-burned sides of venison and fowls hang from hooks in the ceiling, and in one corner there is the preserved remains of two elves, a woman and man. The woman was quite old (young looking, but with long ears) and is sitting in the corner cradling the man, who was much younger than her and died of terrible wounds taken in battle. The woman wears a gown of woolen scarlet, embroidered velvet slippers worth 50 gp and a silver tiara worth 100 gp. The man wears the costume of a wealthy forester and holds in his right hand a broken long sword (once a magical +2 weapon). Upon entering the freezer, a groaning spirit will emerge from the walls of the root cellar and attempt to destroy the intruders. | Groaning Spirit: HD 7; AC 2 ; Atk 1 touch (1d8 + Str); Move 12; Save 9; CL/XP 9/1100; Special: Chilling touch, keening, only harmed by magic weapons and spells. 1705. Amidst the overarching oaks and fecund ferns of the forest, a small mound of earth has been raised and topped by a small wooden idol. The idol looks very old and weathered, the wood cracked and only a few particles of paint still adhering. The idol depicts a woman of earthy beauty, its breasts swollen, belly full, hips round and face regal. Druids, even neophyte druids, will recognize this as a depiction of the one true Goddess behind all mortal conceptions of feminine divinity, and their prayers and offerings (and those of their comrades) will result in each receiving the effects of the Bless spell for one week. Offensive actions directed at the simple idol curse the druid and her friends increase the chance of wandering monster encounters by +2 (i.e. usually to 1-4 on 1d6). 1726. The banks of the river here are coated with run-off from the surrounding farms and villas. Encounters with effluvial grubs, nasty worm-like creatures who burrow and feed on human and animal waste, occur here on a roll of 1-3 on 1d6. | Effluvial Grub: HD 2; AC 5 ; Atk 1 bite (1d4 + infection); Move 9 (B6); Save 16; CL/XP 11/1700; Special: Infection, effluvial gases. 1808. The remnants of a Nomoan road can be spied here, forming a small ridge among the trees and underbrush. The road is mostly overgrown, but still allows fast passage through the woods. It once extended all the way to the mineral springs in . A particularly large oak alongside the road is home to a flirtatious hamadryad who will appear to benevolent looking adventurers and invite them to dine with her. They will find that a wide stump behind the oak has been set with a fresh linen cloth, plates of silver and a meal of venison steaks and berry wine. The dryad, Salena by name, will quiz the adventurers on the goings on of the wider world, and is a fine hostess. Should the adventurers return her kindness, she will send them on thair way with a sack of goodies (treat as one week of iron rations). Should they prove violent, they will be set upon by a gang of buckawn robbers hidden nearby and poised to strike. | Buckawn: HD 1d6; AC 2 ; Atk 1 dart or dagger (1d3); Move 15; Save 18; CL/XP 1/15; Special: Spells, magic resistance 10%. | Salena: HD 2 (13 hp); AC 9 ; Atk 1 wooden dagger (1d4); Move 12; Save 16; CL/XP 3/60; Special: Charm person (-2 save). 1821. A tribe of skunk goblins has built a large stilt village here. The tribe numbers 125 warriors, 150 females and 200 children. The skunk goblin king is Glickwick, who is advised by Wullug the vizier. The tribe’s warriors go into battle mounted on giant killer frogs, making them a force to be reckoned with. | Skunk Goblin: HD 1d6; AC 4 ; Atk 1 weapon (1d6); Move 12; Save 18; CL/XP 1/15; Special: Pungent. | Glickwick: HD 4 (22 hp); AC 4 ; Atk 1 weapon (1d6); Move 12; Save 13; CL/XP 5/240; Special: Pungent. Chainmail, flail. | Wullug, Goblin Adept Lvl 3: HP 12; AC 6 ; Save 13; CL/XP 4/120; Special: Pungent, spells (1st), guide. Warhammer. Art by Dragos Stanculescu from his gallery at Elfwood. Six more delightful things to see and/or do in Western Venatia. – PARS FORTUNA is set to be published in one week. There will be a basic version of the game as a free PDF and a complete version for sale via Lulu.com. I’m waiting on one piece of art, right now, and have a few bits of formatting to finish up. PARS FORTUNA will contain 12 new races/race-classes, a new way to handle weapons and armor (nothing earth shattering), simplified encumbrance, new initiative rules, new magic system with 126 different spells, guides on designing campaigns and dungeons – both for sandbox/exploration type games and plot driven games, 147 new monsters, a sample level 1 dungeon, a sample sandbox and 120 new magic items. Whew! The basic version will have 4 of the races, the spells level 1 to 3, about 48 of the magic items and a bunch of the lower level monsters. Can’t wait to get this one off my plate. Oh – and what do you think about STAR FORTUNA as a sci-fi version? 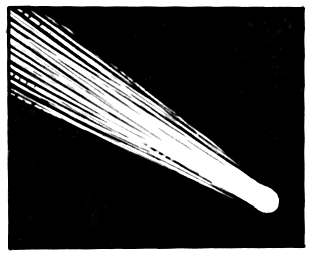 – NOD #6 is in the works – probably will be published early December. This will be a free download to celebrate the holidays. I plan on going free downloads next year and then selling hard copies on Lulu. I think I can make up the lost revenue with advertising – rates will be affordable and the circulation on #1 stands at close to 700 units. – My first Hexcrawl Classic will soon be available via Frog God Games. I’m writing the second one now and should do about 8 or 10 of the things in all. Exciting stuff for me, and hopefully people will find them useful. I’m especially excited that they will eventually be converted into the Pathfinder format, opening a new audience for sandbox-style play. – Mystery Men! was funded and I’m now working with Joel Carroll to get our illustrations completed. I’m going to put scads of time into the MM! rules once PARS FORTUNA and NOD #6 are put to bed. 0913. A tattered cloak hangs on the branch of a tree. The face of a grimacing ogre is embroidered into the back of the cloak. In the presence of ogres or giants, the wearer of the cloak must pass a saving throw or fight alongside them against his comrades or risk the cloak making a choking attack each round as a 4 HD monster dealing 1d8 points of damage. 1616. A female owlbear and her three cubs live here in a dank cave. The cave opens out on a small gully that turns into quite a large pond when it has rained. The gully is surrounded by scrub oak and blueberry bushes. The owlbears look like a combination of great horned owls and black bears. When the female is in season, encounters with males occur on the roll of 1-4 on 1d6. | Owlbear: HD 5+1 (27 hp); AC 5 ; Atk 2 claws (1d6), bite (2d6); Move 12; Save 12; CL/XP 5/240; Special: Hug (2d8) if attack roll is 18 or higher..
1631. There is a geyser here in a large, stony clearing surrounded by a “fence” of massive boulders. Most dwarfs can identify the work as coming from hill giants. Within this compound there is a shallow pool of hot water and mineral salts and the geyser, which erupts every 1d4+3 turns. Folk caught in the gout of super hot water suffer 3d6 points of scalding damage (half that with a successful saving throw) and more-over have their movement rate cut in half from the burns that cover their body for 2d4 days. A cursory examination will reveal spikes hammered into the walls of the cavity from which the water springs. The cavity is safe, though very steamy, if the water is not exploding, and grants access to a complex of limestone caves filled with slippery, sucking mud to a depth of 1 to 3 feet. Movement through the mud caverns is at a rate of 3, and fighting in the mud forces folk to pass a save every time they miss an attack or fall into the sticky stuff. Lurking in the system of muddy caves is a thessalhyrdra that the region’s giants, goblins and kobolds call Yiquartho, which roughly translates as the “Daughter of Heaven’s Whore”. Yiquartho receives sacrifices of gnomes and adventurers on an irregular basis from the evil folk of the woods, and will quickly pick up the scent of new arrivals. The creature’s treasure is scattered through the cavern system beneath the thick layer of mud. Treasure: 3,240 gp and a gold nose stud worth 165 gp. | Yiquartho: HD 12 (57 hp); AC -1 ; Atk 8 bites (1d6) and 1 bite (3d6) and 1 tail (2d6); Move 12; Save 3; CL/XP 17/3500; Special: Acid, poison, immune to acid. 1642. Giant manta rays, silvery blue in color, choke the sea lanes here by day, and at night leave the water to soar through the skies. By day or night, encounters with the beasts occur on a roll of 1-4 on 1d6 in this hex, with 1d6 appearing. 1707. The River Dubglas in this hex plunges down a waterfall. Stretched across the falls are the remnants of a rope bridge. The bridge now consists of a single length of thick rope with the remaining ropes now suspended from it over the maelstrom. The river is not fordable further up river, for it is astoundingly deep, being a primordial gorge that once supported a dark civilization of ophidians. The river is 40 feet wide at this point, and crossing using the rope requires four strength checks (use whatever method you favor, or use saving throws) to avoid falling. A fall plunges one 10 feet down into the river and then over the 30-ft high falls for 6d6 points of damage. 1817. A tall hill of gray stone dominates the landscape. It is topped with several menhirs that jut out at odd angles. An ancient vampiric chief of the Magog is interred within this hill along with a bodyguard of wights. The tomb is accessible from the top of the hill via a small opening near the base of a menhir. One must wriggle through the opening to reach an ante-chamber ringed with menhirs carved with undulating, swirling patterns that cause nausea when stared at for too long. Secret doors from this chamber give access to the deeper recesses of the tomb. Wandering monsters in the barrow include mites, molds, wights and zombies. At the heart of the complex is the tomb of the vampiric chief, kept in a deep slumber in a coffin of silver in the middle of a pool of holy water. 1414. The small farming village of Gormen rests here on the outskirts of Blackpoort’s domain. The folk of Gormen are hard-working an industrious and have a very low opinion of adventurers, merchants and the rascals that populate Blackpoort. 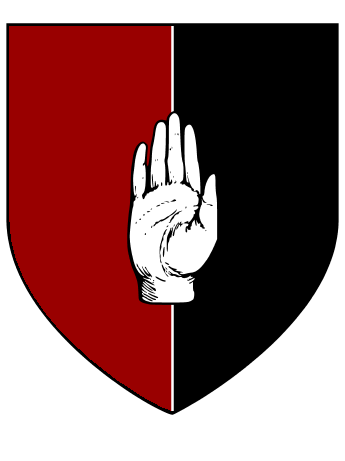 Still, their militia consists of a mere 15 men in piecemeal armor and wielding farm implements (1d4 damage) and slings, so the regular patrols by Blackpoorts soldiers and tax collectors are hard to resist. The village is ruled by a selectman named Eblith, a heavily weathered and creased old man with bushy white eyebrows and hooked nose. Eblith is a brewer by trade, and his brews are renowned throughout this corner of Nod. 1435. The Skrink kobolds live in extensive silver mines that were abandoned by the gnomes many decades ago. The mines consist of five different levels, each level consisting of anywhere from 3 to 6 galleries and one or two shafts leading down to the next level. The kobolds number 150 warriors, 20 females and 60 young and are led by a Niknit and his 20 closest relatives, all 1 HD kobolds. Treasure: The Skrink’s entire treasure consists of 60 gp worth of silver nuggets, each nugget being carried on a separate kobold to avoid losing the entire treasure to plunderers. | Niknit, Thief Lvl 3: HP 13; AC 2 ; Save 12; CL/XP 3/60; Special: Backstab for double damage, decipher writing, thievery. 1450. A particularly dangerous sea serpent that goes by the name of Illweather dwells under the waves here in the wreck of a sleek greatship that was once the pride of Tremayne’s navy. The Golden Ark was lost many years ago after receiving an illicit cargo from a galley that originated in the port of Ophir. The cargo was a silvery sphere that, when held, glows in a swirl of turquoise and taupe and causes the hair on one’s body to stand on end. The holder of this relic of the ophidians gains the power to control wind and weather in an 9 mile radius (i.e. 3 hexes in diameter). The sea serpent has learned of this power and uses it to raise storms in the hopes of sinking an easy meal. | Illweather, Fanged Sea Serpent: HD 8 (40 hp); AC 0 ; Atk 1 bite (1d10 + poison); Move 12; Save 8; CL/XP 9/1100; Special: Poison. 1537. The steaming carcass of an ogre lies here covered by maggots. There are no tracks (not even the ogres) in the immediate area, and no apparent cause of death. 1606. Several days ago a barge was tossed ashore by an errant wave (or perhaps an ill tempered water elemental). Whatever the cause, the barge’s cargo of exotic musks was spilled all over the forested shore and the crew were forced to seek shelter in the boughs of the trees from the parliament of great horned owlbears that have come to investigate the aroma. The five surviving crewmen are exhausted, hungry and completely miserable. | Great Horned Owlbear: HD 7+1 (40, 31, 22 hp); AC 5 ; Atk 2 claws (1d6), bite (2d6); Move 12; Save 12; CL/XP 5/240; Special: Hug for additional 2d8 damage if to-hit roll is 18+. 1611. Some 200 feet from the shore of Blackmere Lake a crag rises from the dark waters. Atop this crag the wizard Delorian chose to build his manse. 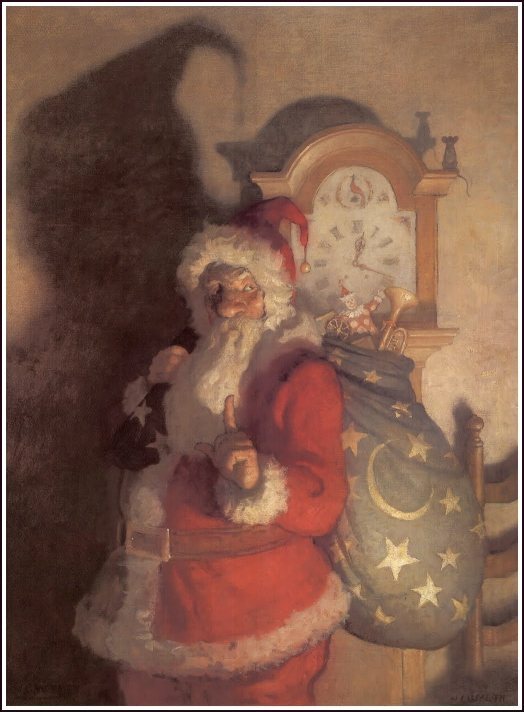 It is here that he observes the stars, records his thoughts, putters about in his laboratory and does all the other things one expects of wizards. Delorian is one of the the most powerful mages in the Motherlands. He is capable of rending the very fabric of reality with his incantations and imposing his will on nature by dint of superior intellect; naturally, this means his tower is subject to almost weekly raids by robbers and adventurers and so is well defended by magical tricks and traps. Deep beneath the surface of Blackmere, the crag is honeycombed by caves that serve as the lair of a family of three mist dragons, allies of the wizard. Visitors can reach the castle by a small dingy tied to a post on the shore. Upon reaching the crag, one must climb a ladder that leads to a small antechamber. At this point the image of the wizard appears before them, questions them and does his best to discern their true motives. If they do not seem to be a threat, he invites them in (the doors are wizard locked). If they do present a threat, all of the items in the antechamber animate and attack, including a richly woven rug, three tapestries, a chest-of-drawers and two suits of armor. Groups that try alternate means of entry are attacked by a flock of twelve gargoyles. Delorian monitors all such battles and summons the mist dragons if the gargoyles seem to be outmatched. If necessary, he involves himself in the combat. Within the confines of his modest home there is a small kitchen, a plush living room, a library closet with a secret door to a laboratory and observatory, and several guest chambers tended by automatons of polished steel with owl faces and sepia tunics bearing the three-handed glyph of Delorian. Delorian is a very lawful man, though he is no prude or stick in the mud. He barely tolerates the presence of the “city of thieves” so close to his tower, and has thought seriously about moving it. Treasure: Delorian’s treasure is kept in a sealed vault located 20 feet below his home. It can only be reached via teleportation and contains several beams that increase the liklihood of materializing within solid stone. The treasure is 11,700 gp and a bronze statue of a portly woman wearing a viking helmet worth 115 gp. Delorian’s grand grimoire contains the following high level spells: Contact Other Plane, Extension II, Teleport, Wall of Stone, Control Weather, Disintegrate, Legend Lore, Limited Wish & Phase Door. | Delorian, Magic-User Lvl 15: HP 30; AC 4 ; Save 5; CL/XP 18/3800; Special: Spells (7th). White robe, staff of wizardry, ornate titanium dagger, three silver darts, potion of healing, bracers of AC 4 . | Small Animated Object: HD 1; AC 5 ; Atk 1 slam (1d4); Move 15; Save 17; CL/XP 1/15. | Medium Animated Object: HD 2; AC 5 ; Atk 1 slam (1d6); Move 12; Save 16; CL/XP 2/30. | Large Animated Object: HD 4; AC 5 ; Atk 1 slam (1d8); Move 9; Save 13; CL/XP 4/120. | Gargoyles: HD 4; AC 5 ; Atk 2 claws (1d3), bite (1d4), horn (1d6); Move 9 (Fly 15); Save 13; CL/XP 6/400; Special: Fly. | Mist Dragon: HD 10 (40 hp); AC 0 ; Atk 2 claws (1d6) and 1 bite (4d6); Move 9 (Fly 30); Save 5; CL/XP 17/3500; Special: Gaseous form, breath weapon, spells.